This is the challenge that I really, really, really need as I’m sure most of us readers do because I quite literally have piles and book shelves and closet shelves full of books that I need to get to reading. Hopefully this helps. So I’m participating at level Mount Blanc 24 books from you TBR Pile. Here goes it . . . I like that the categories have changed up a bit this year and excited to fill the board up. Last year I came within 1 square of the covering the whole board. I’m glad that I found this Foodies Read Challenge for my 2017 reading adventures! We all know I love reading cozy mysteries and some of my absolute favorites are those that are food based such as coffee shops, tea shops, spice shops, bakeries, cafes, and the list could go on and on and on . . .
For this challenge I am putting it all out there and going with the level of CORDON-BLEU CHEF More than 19 books!! 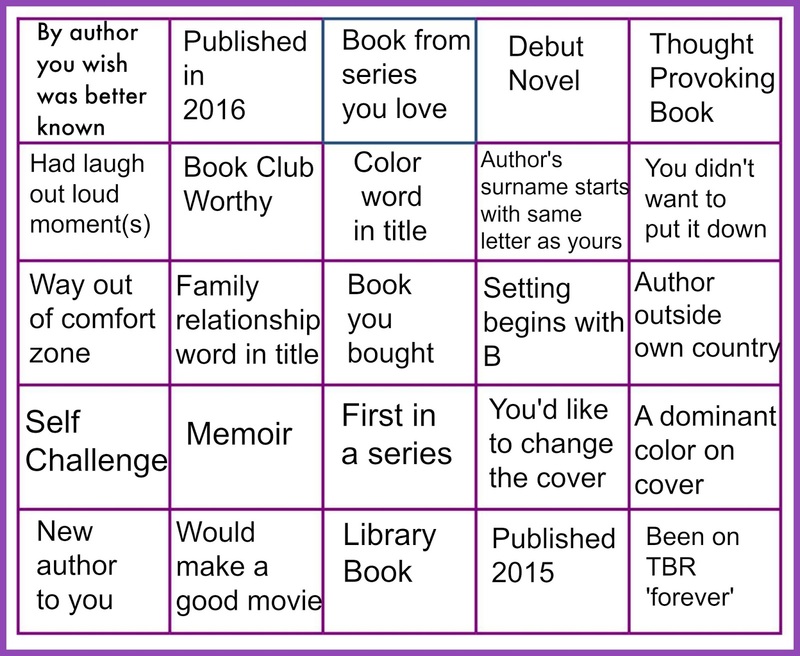 Given that I’m a huge cozy mystery reader I always choose at least one cozy challenge each year. This year I have chosen the Craving for Cozies 2017 Challenge sponsored by Escape with Dolly Cas Into a Good Book. All of the details of the challenge are available here . . .
Time to get reading! Have fun all! 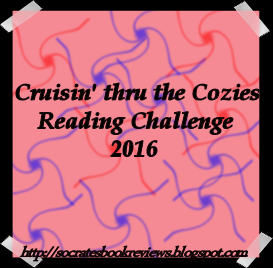 Welcome to the sixth annual Cruisin’ thru the Cozies Reading Challenge! Six years later and I’m still loving those cozies! I hope you’ll join me in this challenge. To find out exactly what a cozy mystery is, check out Cozy-Mystery.com. This site is dedicated to cozy mysteries and does a great job of defining them as well as giving a list of cozy mysteries. This challenge is NOT restricted to what is on their list, it’s just to be used as a guideline in case you need some hints on what to read. 2. The challenge runs from January 1, 2016 and ends December 31, 2016. 3. You don’t have to choose your books in advance. If you do, you can change your list at any time during the year. Books can overlap with other challenges. 4. Books can be in any format – paper, audio, ebooks…it all counts! 5. You don’t have to post a review, but I’m sure others would love to know about the books you are reading and may even want to add it to their reading lists. NOTE: If you don’t have a blog and want to participate, that’s fine. You don’t have to have a blog, just post in the comments section as you finish books. If you belong to a site like Goodreads and review the books there, that’s fine too. Just leave us the link. I also have a group for this challenge on Goodreads and you can sign up by clicking here. 6. If you do have a blog, take the button above, put it on your blog and post about the challenge. Then add your name to Mr. Linky below. Please use the link of your challenge post, not the link to your home page. 7. I’m going to have one link for signing up, one link for completed reviews and one link for your wrap up posts. I won’t be having a monthly link, just one for all reviews read for this challenge. The first day of January is upon us and that means it is time to choose my reading challenges for the year . . . I did this Full House Reading Challenge last year and had a great deal of fun with it so I’m jumping on board again. I really like the new categories she has this year! Here we go . . .
Write and publish a post stating your intention to participate. In the post please include the Challenge graphic and a link back to this post. Then link your intention post at the bottom of this post. Make sure it is the actual post and not just a generic link to your blog. Add your reviews back here on the link in this post. At the end of every three months there will be a U.S. $12 prize with a book of your choice from the Book Depository or U.S. Amazon voucher, for the entries. There will be a new linky then for the next quarter and so on to the end of December. Reviews are not mandatory and if you prefer to keep a list of the books read and the category they cross off the card, then you can still enter for the completion of a Full House by linking to that list on the final linky or in a comment. Jan – March Link Up now live. Each review can only be linked up once in the year. However it doesn’t matter when you read the book in 2016 – which month, just link as you remember or have time. So if you read it in January you may not get around to linking it until say… May. That is fine. Books may cross over from other challenges that you are doing. There will be a final post to link in a summary post for the challenge for those who have completed a full house. This will close on the 2nd January 2017 and a winner will be chosen using random.org for a U.S. $30 prize which again can be used to buy books at the Book Depository or be received as an Amazon voucher. Complete the card below. You can do it in any order you wish. You are allowed “one free exchange”, if there is something on the square you really dislike you may change it to something of your choice. Once you have played this free choice that is it. Mention the exchange in the final summary post. * Setting beginning with B. This can be a country, a state, a place, a street. Or it could be a beach or the bush or a bookshop. Long as a good part of the book is set there, the whole book might be, but it doesn’t have to be. This is a challenge designed for fun rather than stress! Just keep reading and see how many just naturally check off a square. That’s how I play this kind of card. I don’t set out to do it – it just happens in my reading year. Mostly! Unfortunately, even I read 24 books from my TBR pile it won’t even make a dent . . . but tis is the life of a reader!! This will be the fourth year for the Mount TBR Reading Challenge and I don’t seem to be getting those mountains moved at all. Despite the fact that I will have knocked over 100 books off of my 2015 Mount TBR by the end of December, there are still whole mountain ranges waiting to be conquered. As fast as I read ’em and get them off the stacks, my bookaholic ways help me replace them. *Once you choose your challenge level, you are locked in for at least that many books. If you find that you’re on a mountain-climbing roll and want to tackle a taller mountain, then you are certainly welcome to upgrade. All books counted for lower mountains carry over towards the new peak. *You may count any “currently reading” book that you begin prior to January 1–provided that you had 50% or more of the book left to finish in 2015. I will trust you all on that. *You may count “Did Not Finish” books provided they meet your own standard for such things, you do not plan to ever finish it, and you move it off your mountain [give it away, sell it, etc. OR remove it from your e-resources]. For example, my personal rule (unless it’s a very short book) is to give a book at least 100 pages. If I decide I just can’t finish it and won’t ever, then off the mountain it goes and I count it as a victory–the stack is smaller! *A blog and reviews are not necessary to participate. If you have a blog, then please post a challenge sign up and link THAT post (not your home page) into the linky below. Non-bloggers, please leave a comment declaring your challenge level–OR, if you are a member of Goodreads, I will once again put together a group for the challenge there. Feel free to sign up HERE. 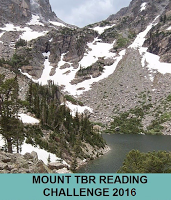 At the beginning of the year, I will once again have a sidebar link for called Mount TBR Review Headquarters for 2016 reviews and progress updates.